If you work in the medical, dental, veterinary, or podiatry field, there’s a good chance that you need a sterilizer. We know that not just any sterilizer will do, so contact a sterilizer equipment expert to get free information about autoclaves and sterilizers. At Sterilizers.com, we have the facts you need to know about the best sterilization manufacturers and equipment. We’re your sterilizer equipment experts, and we’re ready to prove it to you. 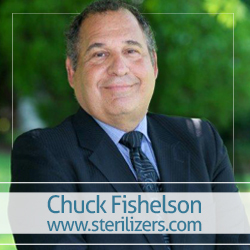 As we discussed in a previous article (The History of Sterilizers), sterilizers have been around for a long time. The sterilization process of the 21st century isn’t just about autoclaves anymore. You can get specialized equipment to meet your specific sterilization needs, including dental sterilizers, steam sterilizers, dry heat sterilizers, table top sterilizers, and chemiclave sterilizers. Additionally, now you must consider the state of your equipment before sterilization even starts. Do you know what you get when you sterilize a petri dish with burned on crude? A sterile, but dirty petri dish. It’s important to clean your equipment before sterilization. Washers, ultrasonic cleaners, and chemical cleaners must be used all prior to sterilization if you want your equipment to be both clean and sterile. At Sterilizers.com, a sterilizer equipment expert can help you choose the right pre-cleaning method for your situation. What’s the difference between cleaning, disinfecting, and sterilizing? Many people don’t know the difference between cleaning, disinfecting, and sterilizing, but they are all uniquely different processes. Cleaning – A process that removes foreign material from an object. Disinfection – A process that reduces the number of pathogenic microorganisms from objects or skin. High level disinfection – A process that kills mycobacterium tuberculosis, enteroviruses, vegetative bacteria, fungi, and more sensitive viruses. Sterilization – A process that destroys all microorganisms including bacterial spores. Cleaning and drying is a necessary step that removes most organisms from the surface of the equipment. You should always clean your equipment before moving on to the disinfection and sterilization process. All items should be disassembled before the cleaning process starts. After washing, rinse the items with clean warm water before drying. The items are now ready for disinfection and sterilization. Dirt and debris can be removed from equipment prior to sterilization via manual scrubbing, but it’s much more efficient to use automated equipment. A washer is used to clean heat tolerant equipment. The cycle consists of several washes and rinses. The detergent you choose should be compatible with the materials and suited for the type of soil. At the end of the cycle, your equipment is ready to be sterilized. An ultrasonic washer is used to remove tiny bits of debris from delicate equipment after manual washing. It cleans the equipment by using high frequency sounds waves to create mechanical vibrations that remove dirt and debris from equipment. An ultrasonic cleaner can remove even the tiniest particles. Once the equipment has been cleaned using an ultrasonic cleaner, it’s ready for sterilization. If you would like more information about cleaning, disinfection, and sterilization, call a sterilizer equipment expert at 877-789-9983 today!